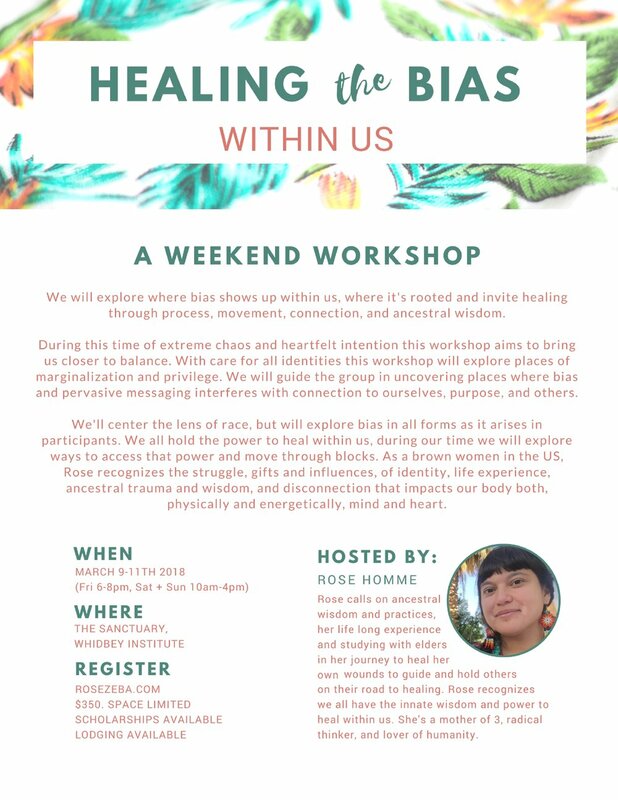 We will explore where bias shows up within us, where it's rooted and invite healing through process, movement, connection, and ancestral wisdom. During this time of extreme chaos and heartfelt intention this workshop aims to bring us closer to balance. With care for all identities this workshop will explore places of marginalization and privilege. We will guide the group in uncovering places where bias and pervasive messaging interferes with connection to ourselves, purpose, and others. We'll center the lens of race, but will explore bias in all forms as it arises in participants. We all hold the power to heal within us, during our time we will explore ways to access that power and move through blocks. As a brown women in the US, Rose recognizes the struggle, gifts, and influence, of identity, life experience, ancestral trauma and wisdom, and disconnection that impacts our body both, physically and energetically, mind and heart. We will start with an evening circle Friday 3/9, then meet again 10am-4pm Saturday and Sunday 3/10-3/11.